Porto Torres is in the North West of the popular and historic island of Sardinia situated off the west coast of Italy. You can compare and find the cheapest ferry crossings available from Porto Torres with our easy to use booking form. SNCM, Grimaldi Lines, Grandi Navi Veloci, La Méridionale (formerly CMN) and Moby Lines are the ferry companies that operate out of Porto Torres. Below, you can find all the Porto Torres ferry timetables, journey times as well as our best prices. SNCM ferries are a major operator in the Mediterranean connecting Italy, Greece and Croatia. From Porto Torres you can take SNCM ferries to Ajaccio and Propriano in Corsica and Marseille in the South of France. All SNCM ferries provide a wide range of onboard facilities including restaurants and free shopping. Some ships also provide a games room, a swimming pool, a jacuzzi and a disco. Moby Lines ferries provides ferries from Porto Torres to Genoa in the North of Italy. Moby Lines ferries come with a wide range of onboard facilities. On board you find all Moby Lines ferries have children's play areas, games rooms and restaurant facilities as well as a range of cabins and seating options. Some Moby Lines ferries also have swimming pools, a la carte restaurants and bars. Grimaldi Lines ferries provides ferries from Porto Torres to Barcelona in Spain and Civitavecchia in Italy near Rome. Grimaldi Lines, founded in 1945, owns one of the largest fleets of multi-purpose roll and roll off car carrier vessels in the world. All Grimaldi Lines ferries are large and spacious and offer a wide range of facilities. For example, restaurants and bars and children's play areas along with comfortable seating and ensuite cabins if required. La Méridionale (formerly CMN) Ferries provides ferries from Porto Torres to Marseille in the South of France and Propriano on the French island of Cosrsica. La Méridionale's fleet is made up of three ships the Girolata, the Kalliste and Scandola which all carry foot passengers, vehicles and freight. On board you will find restaurants, walking decks, a cinemas well as spacious cabins and lounges. Grandi Navi Veloci ferries , founded in 1992, is an Italian ferry operator which connects Italy and Sicily with Sardinia, Spain, Tunisia, Malta and Morocco. They operate an impressive fleet of conventional and cruise ferries. They offer a wide selection of cabins, including disabled cabins, all with en suite facilities. On board you will typically find full and self-service restaurants, a snack bar and shops. On board some larger ships you might also find a cinema, swimming pool and even a gym. From Porto Torres, they go to historic Genoa in Italy. 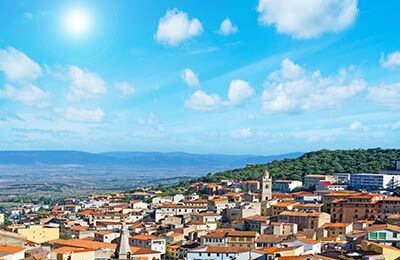 So, book your ferry from this beautiful Sardinian town to Corsica and mainland Europe simply and securely with AFerry. 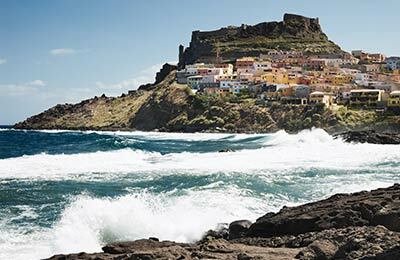 Ferries from Porto Torres on the northwest coast of Sardinia sail to Genoa in Italy, Marseille in France and Ajaccio and Propriano on the island of Corsica. All ferries from Porto Torres can be booked easily and securely online through AFerry. Porto Torres's port contains all of the basic amenities, such as toilets, check-in and car parking but very little else. Although the port is not located very far from the town so all other amenities are a short walk or drive away. Expressway SS131 connects the rest of Sardinia to Porto Torres. There are also train services around the island which allow you to get to Porto Torres.